People who like to fish spend a good amount of time talking about the different things that can help them catch more fish. There are a number of considerations that can partially or fully determine our fishing success, but perhaps the one consideration that we talk about the most is lure color. Beginning and expert anglers alike are always trying to determine how much of a factor lure color has on our fishing success. Following are some thoughts on lure color. In the minds of many accomplished anglers the lure color question is this simple: Sometimes color matters, sometimes it doesn’t. When the fish are biting, they’ll often hit any color you put out there. When they don’t want to eat, color becomes one of several very important considerations. There are times when having the “right” color of bait on the end of your line will result in more fish being caught. 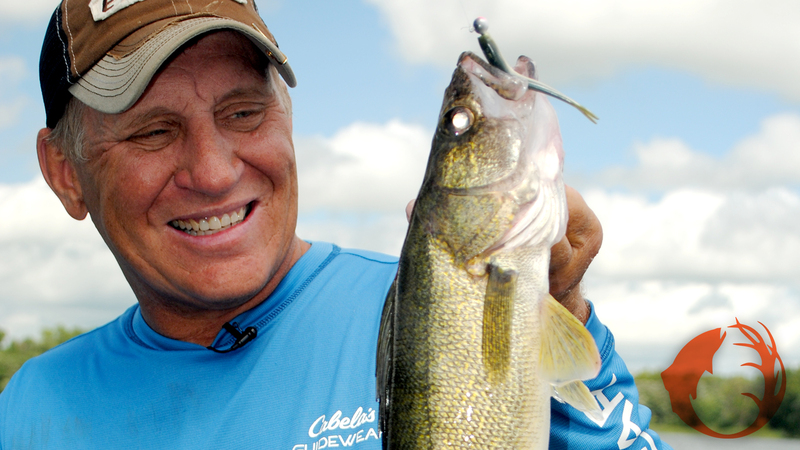 Mike Frisch took this walleye from clear water on a jig and Impulse Smelt Minnow. On this day, on this lake, the walleyes wanted a natural color. There are ways to increase the odds of showing a fish the color they might prefer on a particular day. Let’s say we’re after walleyes and we’re using jigs with a soft bait trailer. If there are two anglers in the boat, one angler should try, for example, an orange jighead with a chartreuse tail: That’s a great walleye color combination almost anywhere. The other angler should try a pink head, white body. By doing so, we’re showing the walleyes four different colors. We’re increasing the odds of showing them the color they want on that particular day. Now, let’s say the angler using the orange/chartreuse combo is catching more fish. If you want to fine-tune your color option, one angler should try an orange head/orange tail jig, the other should tie on a chartreuse head/chartreuse tail jig. By doing so, we’re going to see if there really is a dominant color on that particular day. Sometimes there will be a definite color preference. Crankbaits come in a wide variety of colors, and that’s because there are times and places when one color is better than another. There are times when a natural appearing crankbait, a crankbait that looks like a real baitfish, will be better. And, there are those times when a weird, gaudy color that looks nothing like a baitfish will be better. Usually, natural appearing baits will be better in clear water, and usually the gaudy baits will be better in stained or dirty water. Usually, but not always. You need to keep experimenting with color until you get it right. None of us know for sure how much of a factor lure color is in fishing success, and maybe we never will know. However, if you experiment with color, you’ll probably decide that, at times, if you’re using the right color, you’ll catch more fish. This year, try different lure colors when the fish are biting good, and try different lure colors when they’re not so active. You just might determine that lure color can make a difference.